Immigration in Texas is a huge issue – we’re going to cover a the subject of an influx of people into Austin, but probably not the kind you are thinking of. If you are a young professional living in Austin, chances are that you already know that according to a recent Brookings Institute study from 2007-2009, more young people moved to Austin than any other city. The whole state of Texas gained popularity nationwide, as Dallas was the second most popular city among the 24-35 year old demographic, with Houston taking the 4th spot. In case you were wondering where people are moving from, the answer is everywhere. Take a look at the following screen capture, courtesy of a Forbes.com Infographic that shows net migration patterns for every county in the United States. 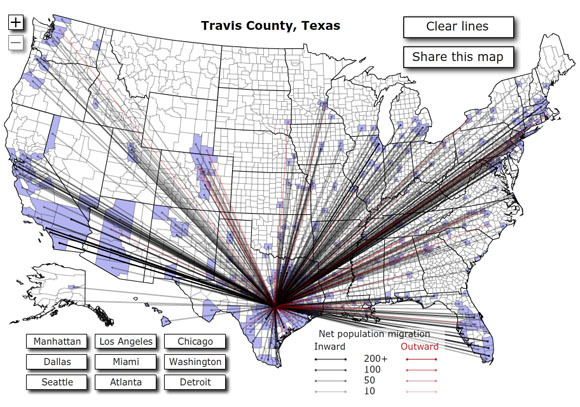 In this infographic, black lines mean more people are moving into Austin, while red lines mean people are leaving Austin. Immediately, you can tell there is a heavy influx of people from counties in California, the Northeastern States including New York, the Midwest (mostly around Chicago and Detroit), and Florida. For example, when you look closer at the Austin-LA connection in 2008, you can see that 1,170 people moved from from Los Angeles to Austin, while only 457 people moved from Austin to LA, a difference of more than 2.5 times. Similar ratios can be found in the relationship between Austin and Miami (1.9 ratio), and Chicago (1.7 ratio). Even within Texas, there is a pattern of migration to Austin. One final noteworthy data point from the same Brookings Institute study is that migration patterns are making Austin a more educated place to live. 2.8 times more people with college degrees are moving to Austin than are leaving. All very good news! To those who have moved to Austin recently or who are thinking about moving, the photo book that is the topic of this blog entitled Austin, Texas: A Photographic Portrait, serves as a great introduction to the city. The photos and captions in the book show off the best the city has to offer, from more obvious tourist attractions to slightly off the beaten path museums, parks, and scenic overlooks. The book is great for those few who have recently left the city and would like a memento of the great city they have left behind.